A Newark man has been fined for transporting waste without the proper licence. A 54 year-old man has been fined £319 after pleading guilty to transporting waste without the necessary licence. The offence was discovered during Operation Transporter; a multi-agency operation between the Environment Agency, Nottinghamshire Police, Driver and Vehicle Standards Agency (DVSA) and HM Revenue and Customs. On 19 October 2018, at Nottingham Magistrates’ Court, a man was fined £154, £50 for breach of a suspended sentence, £85 towards prosecution costs and a £30 victim surcharge. He was caught transporting controlled waste without a licence during the multi-agency road stop on the A617 at Averham, near Newark in Nottinghamshire. Police directed him to pull in to a layby where his transit van was examined and confirmed to be carrying scrap metal and other waste. A search of the public register revealed that he did not hold a waste carrier licence. He refused to cooperate and refused to be interviewed under caution and stated that he would see the officers in court before he drove off. Householders and businesses should only use licensed waste carriers as this offers them greater certainty that their waste will be managed properly after they have handed it to a waste collector. 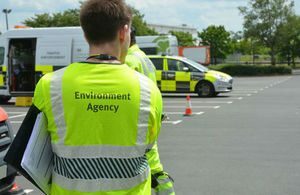 We hope that this case sends a clear message to the waste industry and wider business that you need a licence to transport waste and that checks are being made to identify those who refuse to comply. We will prosecute offenders who fail in their obligation to register. The outcome of this case shows the value of multi-agency operations such as Operation Transporter in fighting environmental crime. As this case shows, unregistered waste carriers face an even greater risk of being caught and prosecuted as a result of these operations. Operation Transporter is taking place regularly on roads across the East Midlands and South Yorkshire whilst its sister operation; Operation Highway is taking place regularly on roads throughout Nottinghamshire.